How do you know what is a good looking kilt, made to last for more than a lifetime? How can I tell the difference between the different qualities of kilts? How long should my kilt be? Is it too short? Is it sitting too high? What should the back look like? Why does the bottom of the fringe not lie flat? Can I get away with just moving the straps? How do I know if my kilt can be let out? Are your questions considered below? If not, I shall endeavour to find the answers if I don’t have them already. Further information and different views are very welcome. This is a matter of preference. Some prefer the bottom edge of the kilt to be to the top of the knee and others prefer to the middle of their knee. It is important to ensure that there is some bare leg between the top of the kilt hose and bottom of the kilt. In nearly all the older portraits the lower edge of the kilt invariably shows the knees of the wearer. Apparently, the knees are symbolic of humility and strength and ought to be shown. Lord Campbell suggests that the kilt is better worn short, as it is apt to look ill and give a kick that is very ugly in walking if worn too long. It should hang from the hip, swinging freely to the motion of the body. The fringe of the apron edge should just cover the first pleat on the wearer’s right hand side and the centre back and front focus points are centred. The un-pleated cloth of the under apron should not be exposed. The kilt should fit snugly into the small of the back and then widens in shape to comfortably cover the buttocks (the seat) at the same time, keeping the apron straight up and down. Therefore the width of the pleats at the waist are narrower that at the seat. The depth of the pleats’ stitching (the fell) should be about a third of the total length of the kilt. The stitching should stop at the widest part of the seat. A firm inner canvas and a fine secondary canvas are used in the construction. The inner canvas is hand pad stitched to create maximum shape. This back shaping is moulded by the tailor’s stitches which preserve the stitching of the pleats and the shape. The top of the kilt apron should sit high on the waist and lie smoothly across the abdomen. It is important when the abdomen is large to avoid having the tummy protruding over the top of the apron and still endeavour to wear the kilt high above the tummy button. If you wear a tie, you want the tip to be just a bit below the top of the kilt. The apron is a subtle A-line shape retaining the symmetry of the tartan and a central focal point of the tartan for middle of the apron. The aim is to have the fringe edge of the apron resting on the last pleat at the right side and not allow the edge of the apron of the kilt to project beyond the pleats. If the apron does not have enough width at the hemline, the apron will not lie flat and will also provide a gap between the apron. If there is too much width, the apron will not lie flat at the front and will overlap the pleats. There will be excess cloth. The apron can be reshaped to ensure it lies well. If the circumference around the thighs is greater than the seat as is common in some sportsmen, the apron size and shaping can accommodate this to reduce the effect on the lie of the apron. There should be no darts in the apron at the front. All shaping should be done at the edges of the apron where the apron meets the pleats. As the buckles lie exactly at the waist, the top of the kilt will then be about two inches above the centre of the buckle. The top quality bespoke kilt is meticulously tailored and every stitch is sewn by hand. Some kilt makers make a concession to machine stitch only the the waistband onto the kilt as it is a straight seam. The traditional master tailors constructed their kilts to the same standard as they tailored other garments e.g. jackets. This enabled them to manipulate the fabric by hand and allow for the small nuances that ultimately give the garment greater flexibility, dimension and match the detail of the tartan with precision. The kilt is a creation of absolute dedication and skill involving around 30 hours of work. The less handwork that goes into the kilt, the less character the finished garment has. The less soul, beauty and life it exudes. The pleats are stitched on the outside of the kilt. The stitches are tiny and close together, consistent in distance and tension, and are barely visible. Using a matching thread, the stitch just catches the edge of the pleat. The stripes in the tartan across the pleats must match with precision. Misalignment and even a slight step of the horizontal stripes between pleats are not necessary with skilful hand stitching. Uniform width: Each pleat should be of uniform width and taper smoothly from the seat up to the waist. Straight Tartan elements: Stripes and colour boundaries should also be straight with the pleat. Pleated to the “Sett”: When the kilt is pleated to the “Sett”, through careful planning and calculations, the pattern should be reproduced accurately with some slight variation in width to keep within the wearer’s measurement. Pleated to the “Stripe”: The prominent stripe should be situated in the centre of each pleat. In an adult kilt, it is preferable to have between 27 and 34 pleats each with a minimum depth of pleat 7 cm and maximum of 15 cm. This part of the construction process ensures the pleats are secured above the level of the seat and keeps them from stretching and sagging over time. This stitching takes time and sometimes to reduce the construction time, less and bigger stitching is carried out or missed out entirely. You can tell if this process has not been carried out in full, if you can stick your finger right up the back of the pleat. The waistband tartan should match the inner and outer apron and there should be symmetry across the back with a centre focus point to match the back pleating area. The waist band should have extra fabric folded within it, at each end of the outer and inner aprons. 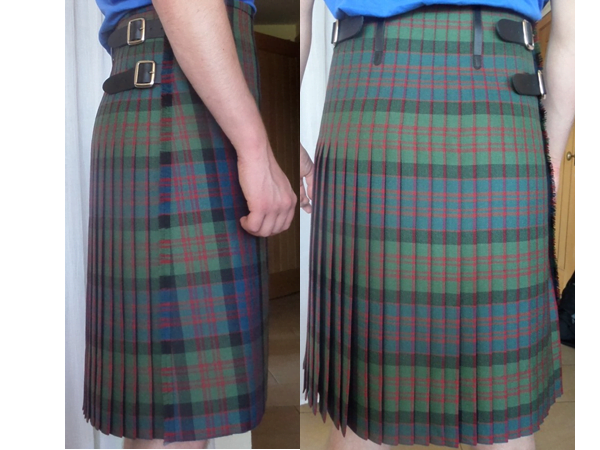 This will help matching between the waistband and the kilt when altered. The chapes and belt loops are cut to match the tartan where they are placed. They are neatly stitched onto the pleating area and through the canvasses for strength and not to distort the pleating area. The bar of the buckle should be sitting over the join between the 3rd and 4th pleat on either side. The bar of the 3rd buckle should be over the 2nd and 3rd pleat on the right hand side. The vent for the inner strap to come through should open between the 2nd and 3rd pleat. It should have reinforcement within by the inner canvassing reaching to the edge of both sides of the vent and have neat buttonhole stitching at the top and bottom of the vent. The pleats and aprons are supported by a rough canvas. The canvas is pad-stitched to the inside of the pleats to support and secure the stitching and shape the back. Along with a secondary canvas, the important fitting along the small of the back is determined. The apron canvas provides structure and reduces creasing across the front of the tummy. Your bespoke tailored kilt is unique and made to fit you perfectly. It is constructed according to the processes and techniques of the military master tailors and kilt makers which ensure the cloth is protected, it can be altered and continue as a perfect fit. As an heirloom, it can be passed on to someone of a different shape and altered to fit them.